In early December, Skeleton released a new updated version. In fact, it was its first update for almost two and a half years. That’s good news for those of us who have used Skeleton in the past and loved its simplicity! In this article, I’ll introduce you to this lightweight CSS framework. I’ll start giving a brief intro about it and presenting its major features. Then I’ll show you how to use it in a real project, which will be based on a demo page that I’ve built. As mentioned above, Skeleton is a lightweight CSS framework (or boilerplate, if you prefer this definition) created by Dave Gamache. More specifically, it’s two CSS files: the popular normalize.css file and the skeleton.css file. The latter contains the framework’s styles, which are limited to around 400 lines of uncompressed code. The most important part of Skeleton is its grid system, which I’ll analyze later in this article. Additionally, the framework provides basic styles for common HTML components like buttons, lists, tables, and forms. To get the latest version of Skeleton, you can visit the website and download the zipped folder. An alternative option is to fork the GitHub repository. Similar to frameworks like Bootstrap and Foundation, Skeleton also uses a mobile-first approach. However, as discussed, it doesn’t include the large number of components that those frameworks offer; it contains only some fundamental CSS rules that help you kick-start your development process. It’s worth mentioning that Skeleton is fully functional in all the latest browsers including IE9+. Finally, you can also opt for the Sass or Less extensions of Skeleton. Skeleton’s latest version defines a mobile-first 12-column fluid grid, consisting of rows and columns, as with all CSS grids. Rows have to be placed inside a wrapper that can have a max-width value of 960px. To create the wrapper you define a div element and apply the container class to it. If you’re familiar with Bootstrap’s grid, you might know that Bootstrap uses the same class name to define its wrapper. Columns are nested inside a row. They scale up to 12 for each row. To set up a column you have to define a div element and assign it two classes. First, you add the class that is responsible for specifying the column widths. To achieve this, you can use any class from one to twelve or the one-third, two-thirds, and one-half classes. The second class is responsible for setting the column margins. Possible classes are columns and column. If you define the column widths with the first option (e.g. using the two class), you should use the columns class (instead of column) as a second class. The exception is when using the one class, which can be equally combined with the columns or column class. While other frameworks support nested rows, Skeleton recommends not nesting rows within columns. Moreover, Skeleton’s grid system provides extra classes for offsetting your columns. Offset classes (e.g. offset-by-two) allow you to increase the space between columns by adding a margin-left property to them. As mentioned, beyond its well-structured grid, Skeleton comes with additional predefined styles. For example, there’s the button class, which allows you to style an anchor (a) element as a button. There’s also the option to give the button a light blue background-color using the button-primary class. Another example is if you want to float an element to the left or right, you can add the u-pull-left or u-pull-right class to it. You can also use the u-cf helper class for clearing floats. Those are just a few of the examples of utility classes bundled with Skeleton. Now it’s time to use Skeleton’s powerful features in a demo project. We’ll explore three different examples. This ensures that the columns will be stacked. Next, when the window’s width exceeds the 549px, Skeleton’s grid becomes active causing our columns to occupy 50% of the row’s width (as indicated by the class name one-half). Of course, our layout is based on Skeleton’s default breakpoints, which we have the option to change. Note: Instead of using the one-half, column class pair as class names, we could have used the six, columns pair, which would produce the same result. Let’s look at our second example. Below is the layout of our section.about when the viewport size exceeds the 549px. Notice that the first column occupies two-thirds of the row’s width and the second one occupies one-third. Again, for extra small screens our columns are stacked and have widths of 100%. Note: Instead of using the two-thirds, column and one-third, column pairings as class names, we could have used the eight, columns and four, columns pairs respectively, with the same results. Let’s see our last example. In this case, the target row consists of one column. This occupies about 65.33% of the row’s width. We also want to center it. For this reason, we use the offset-by-two helper class. 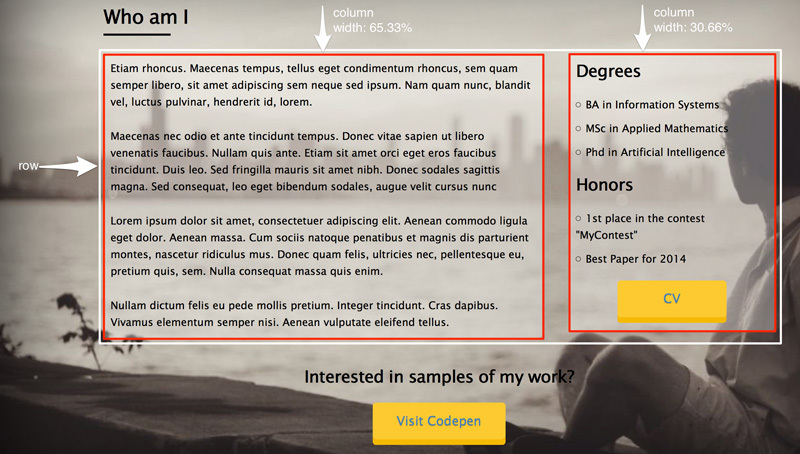 See the Pen Skeleton layout example by SitePoint (@SitePoint) on CodePen. In this article, we’ve looked at the main features of Skeleton, a CSS boilerplate that can speed up your front-end development. Of course, keep in mind that Skeleton isn’t a one-size-fits-all solution for all projects. It’s simple, yet limited. Have you used Skeleton in any of your projects? Do you like its simplicity or do you prefer working with a more comprehensive framework like Bootstrap or Foundation? Nice job! Thanks for sharing it! I created www.archivesalive.co.uk on the old Skeleton. Thanks for drawing my attention to this mobile-first update, I'll give it a try! Glad this article helped you learn something new! Thanks 2 ton George. Inclusion of additional files fixed the issue and now it works like a charm.